The CL5 is a 5 head filling machine designed to fill and seam standard aluminium cans. It is specifically designed for the micro-brewery environment where space can be governing factor. The unit can be static or used as a mobile unit. Although it is a basic unit it still carries all the equipment of the larger units. The CL5 can line has a footprint of 2000mm x 600mm. The throughput of cans is between 1200 and 1500 cans per hour, this is based on the equipment in the brewery and temperature. Throughput can be increased via speed control valves once the customer is competent with the operation. These speeds are based on the correct presentation of product. The CL5 machine comes fitted with user touch screen to enable operators to start and stop the machine, test single functions, set fill and fob level and change times. All machines have intelligent online facilities. This allows owners to monitor and count throughput. It also allows the manufacturer to connect to the machine for fault diagnosis and software update. A sim card with data connection is required. Stainless steel box section support frame with drip tray. 2000mm conveyor throughout machine creating accumulation at start and end. 5 x C02 purge ports for fill pre purge. C02 mechanical flow indicator for visual C02 presence. 5 x 316 stainless steel pneumatically operated filling valves. Electrically operated and adjustable level sensors. Single lid slide with lid cassette sensor. Lid in place sensor before seamer. Lid tamp cylinder before seamer. Single head seamer fully machined from 316 stainless c/w titanium seam rollers. Can wash and blow off built in. Compressed air supply low level alarm. Pre start diagnostic check of all cylinder operation. Compressed air and C02 filtration and regulation. 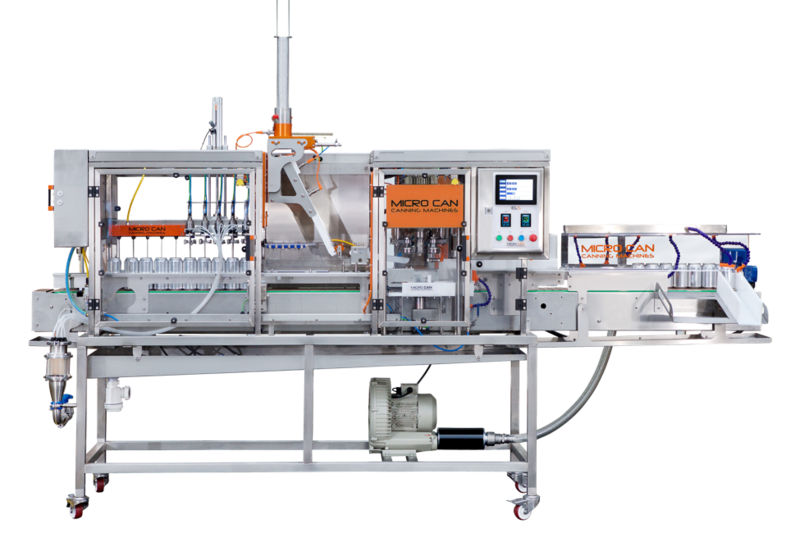 The CL5 is the must-have fully integrated, automated canning solution that cleans, fills and seals cans ready for sale or retail.